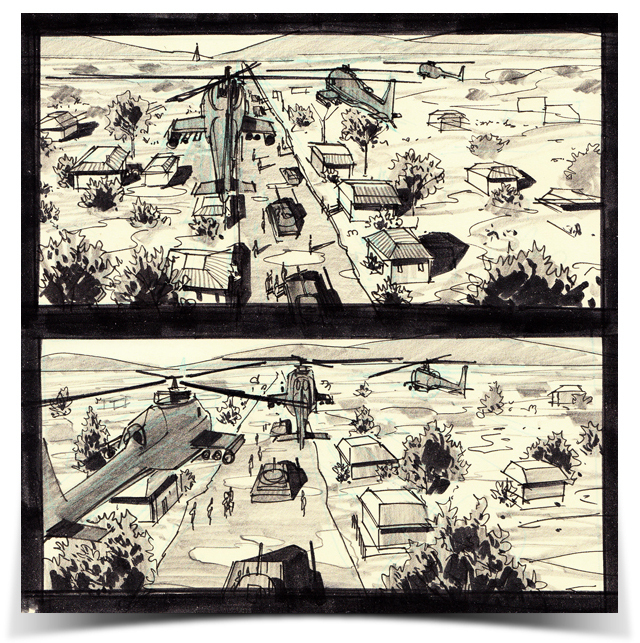 Storyboards used to be and in many cases still are done using traditional media- paper, pencils, ink pens and markers. These things are easy to carry around and are inexpensive to purchase. They are both basic and fundamental. These basic supplies should be in the kit of any storyboard artist. They are essential for situations where an artist is needed in an emergency situation, on location. One example was on a film called Five Days of War, directed my Renny Harlin. I was on location with the crew in a small town called Tsalka, in the Republic of Georgia. There was a huge exodus scene involving hundreds of local extras, thousands of blanks, pyrotechnics, animals, two Georgian attack helicopters and a camera helicopter. The pilots were Georgian military and didn’t speak English. Renny was running into language barriers and had to be sure the pilot understood how he wanted the scene shot. I got the call where I was working in a trailer back at base camp. I ran about 4 village blocks, trudging through thick muddy roads to the shooting location and was told what I needed to sketch. I drew up a few shots in a Moleskine notebook which was quickly handed off to Renny. Drawing is a universal language, if you can draw, you can communicate with anyone who can see. Below are a couple of the on-the-fly boards, done in a matter of minutes for the Georgian helicopter pilot. For the most part these days, I do work digitally though. There’s no shame to be had in it. Using technology to better your product, provide a better and more useful tool for your client and to work more efficiently is only wise. 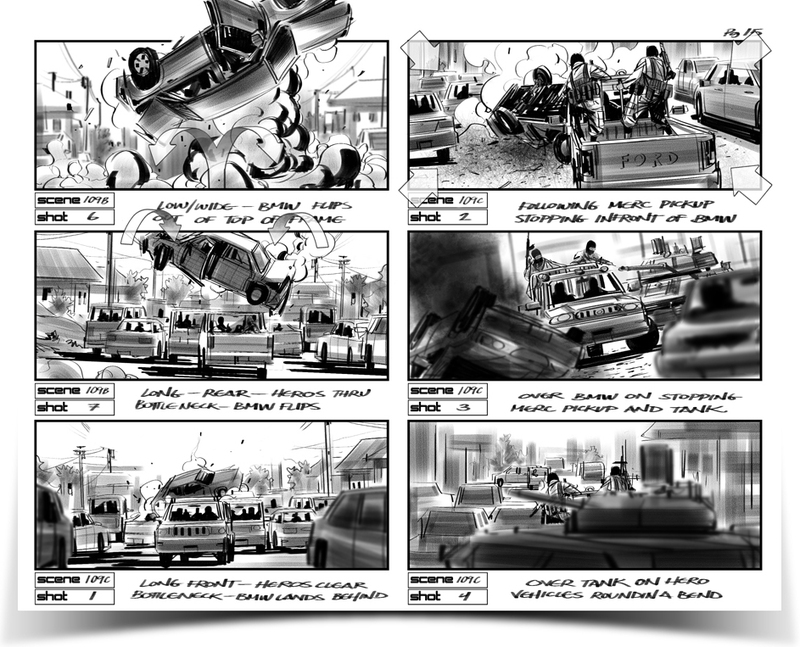 Storyboarding or any form of commercial artwork is not fine art. It is impossible to cheat. You do whatever you need to to get your client, be it a director or whomever, something that will help them and ideally make them look as awesome and creative as you can. Using computers to create and manipulate images is an extremely efficient and effective tool. With computers, working digitally, an artist can reuse images already created, easily combine elements into new images, repair and adjust sketches, all in ways not possible when working on actual paper. Again, the aim is to get your client what he needs as fast and accurate as possible. Your job is to convey his idea, to duplicate it so that others can sync up with and work toward making his vision a reality. Adobe Photoshop is a great program. I probably don’t even need to mention it. The program I use for all of my commercial, digital artwork is Corel Painter 11. It does have problems, glitches and needs to have plenty of kinks worked out but what makes it worth it is Painter’s brush engine. The brushes in Painter are awesome and often times, work created in Painter can be difficult to tell apart from work created in traditional media. Many clients still don’t like a very “digital” look. This is another situation where Painter comes in handy. You can work digitally and a client who doesn’t like a digital look will be happy with what you turn in. Using draw on-screen tablets such as the Wacom Cintiq or tablet computers such as the Axiotron Modbook is also a very natural feeling way to go. Back in the Republic of Georgia, pretty much all of my work was done on a Modbook. 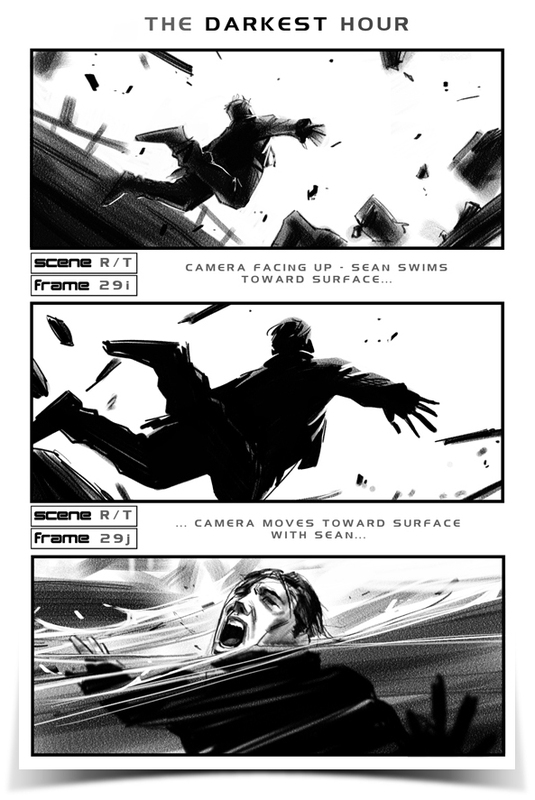 You can see more storyboards and illustration here. Ideally, being proficient with traditional media is the way to go. Having that tool in your belt, explore going about the same thing using digital tools. See what works best. But ultimately, regardless of how you get there- tell your stories as best you can pull the viewer in and don’t let him go. Draw and draw a lot. Have fun!